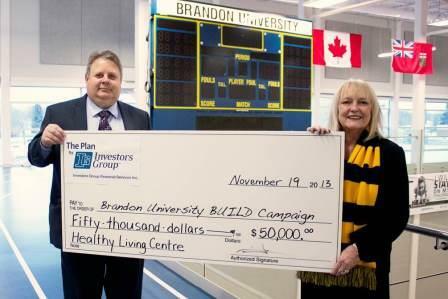 BRANDON, MB – One of Canada’s leading financial management companies is contributing $50,000 to the state-of-the-art Healthy Living Centre (HLC) at Brandon University (BU). Investors Group will receive corporate name recognition on the score clock in the main gym of the HLC, the home to BU’s Bobcats basketball and volleyball teams. Investors Group, founded in 1926, is a national leader in delivering personalized financial solutions to Canadians through a network of approximately 4,600 Consultants located throughout Canada. The Healthy Living Centre provides BU and the Westman community with a state-of-the-art facility for sports, recreation, and enhanced community programming.